Got my box from DCBS last night, and that means I got to read The Savage Hawkman #5! The quick version: I liked it. A lot. This may be the best issue of the series so far. The art looks great, the dialogue sounds better, and the new storyline is compelling. I'm going to try to get a full review up real soon! I don't remember what this was originally solicited as, 6 issues or 8. Looking at the future of this title as we know it, 8 issues is the correct length for collection. The first four issues obviously are the Morphicius storyline, then no.5-7 deal with the Gentleman Ghost. Issue #8 evidently will have the return of Aksana and introduce more alien characters, and then Rob Liefeld comes in at #9. Beyond the simple fact that #9 is the creative team change (meaning that the entire Daniel/Bonny/Tan run will be collected in one volume), since I expect the series to take something of a right turn (or left turn if you prefer, I'm not picky) when Liefeld takes over the writing chores, it makes sense to stop there. 13 of the 52 (25% for the mathematically challenged) are collecting 8 issues; of course, the 6 cancelled titles are part of that number. And additional 19 titles collect the first 7 issues, meaning that less than half of the New 52 are being collected as the "traditional" (ha!) 6 issue trade paperback. Is this the start of a trend for DC with how they handle their collected editions? While I understand the concept of getting one story arc in a trade, I have to admit that I do like trades where you get two full stories, or perhaps two stories and a done-in-one or something. To me that adds "re-read value" to a trade. A lot of the collections for Hawkman volume 4 are like this and make for an enjoyable reading experience -- to this fanboy, anyway. Also, 8 issues for $15 is a pretty darn good value I think. Of course the cynic in me wonders if DC expects low sales for this volume and is putting it out there as a low cost purchase to spur some impulse buys. Either way, I'm not buying it because I don't double-buy comics; I don't have the budget nor the inclination for that. 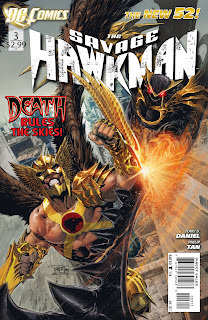 The Savage Hawkman #5 -- It's Hawkman versus the Gentleman Ghost and an army of the undead! Sounds like a "can't miss" to me! You can check out the preview right here. Hawkman by Geoff Johns Omnibus v.1 -- This tome collects Hawkman v.4:no.1-25, plus JSA #56-58 and Hawkman Secret Files. I have all of these issues in trade already, but if I can find a good price on this I will pick it up just to 1) have everything in one book and 2) support the idea of Hawkman Omnibuses (Omnibi?). In any event I very much enjoyed most of these issues so I heartily recommend this collection to someone wanting to get a big chunk of modern Hawkman stories to read (along with JSA v.3, "The Return of Hawkman"). Over at Pop Matters, we have an interesting opinion piece comparing Tony Daniel's work on The Savage Hawkman with the old Gold Key science fiction books, as well an exclusive preview of issue #5! The author, shathly Q (an alias, I assume! ), raises some interesting points regarding how Hawkman compares to some classic science fiction archetypes. I don't think I would have compared Savage Hawkman to either Flash Gordon or Turok, Son Of Stone, but it's an interesting conceit. So check it out, and the preview, though I typically avoid previews of books I am definitely buying! Thanks to Matt Orr (@Hawkmanfans on Twitter!) for the find! Another day, another hype piece from incoming Savage Hawkman scribe Rob Liefeld, this one from CBR. For Carter Hall, it's all about discovery. He's just beginning to get the hang of this Hawkman gig when he is throttled from all sides by multiple challengers looking to control the Nth metal. His comfort level is radically disrupted. How he responds to these challenges will reveal more about his character. Not a whole lot about Hawkman but worth reading. It seems that the promotion of Bob Haras may have a good deal to do with Liefeld's new assignments, which makes sense at least. Right now I am waiting for the issues of Hawk and Dove which Rob is writing to really develop a solid opinion on his writing. Because, being honest here, I am not sure I have ever read anything the man has written, only heard bad things about it. I wouldn't want to be judged by work I did 20 years ago, either, so a fair shake is the least I can do. Newsarama has an interview up with Rob Liefeld regarding his upcoming stints on Deathstroke, Grifter, and The Savage Hawkman. Some insights are provided, including the confirmation of my suspicion that he will have a co-writer on Hawkman, which is something of a relief for me. Except that co-writer will apparently not be Tony Daniel; it's TBD. He's an open book as far as direction is concerned. The Nth metal armor, which Carter possesses, is in huge demand. It's power, and the secrets it possesses are desired by dangerous players, from our world as well as other worlds and dimensions. He is surrounded by danger and opponents who appear to have him outnumbered, and yet he fights back with a vengeance and takes matters into his own hands. The other big news out of this article is the exit of Philip Tan on art, replaced with Joe Bennett from Deathstroke. I'm not sure if I have ever read a title with him on the pencils, but a quick Google search indicates that he will be a big change from Tan. Of course pretty much anyone would a big departure from Philip Tan. I am still not really thrilled with this turn of events, but I have to call it as I see it: the hints which Liefeld drops are a mix of typical hype and what sounds like a reasonable connection to what this series has been established as in the first arc. The Nth metal armor evidently plays a big role, and makes Hawkman a target; this seems to be in line with the Daniel stuff. And Liefeld's desire to have Hawkman soar higher (to steal a phrase from commentor Joseph, whom I still need to respond to... sorry, about that Joseph...) certainly sounds good, but every comic creator says this when they come on a book. I don't care for Liefeld's rendering of Hawkman in this article. Something about the helmet and belt doesn't look right to me. Of course, we must still play the "waiting game" on this new direction for the Winged Wonder. From The Source we have a solicitation to go with the previously revealed cover to The Savage Hawkman #8. Sounds like a fun story, to be completely honest. The Savage Hawkman as a title is pushing the science fiction/aliens among us angle and this story sounds like it will fit right in with that motif. Like the subject says, we have a new poll here on the blog. 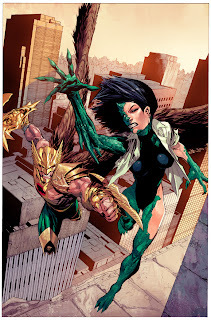 Short and sweet: "Rob Liefeld on Savage Hawkman, what do you think?" Please click through and vote! Thanks! Alright, so as we all know by now, Rob Liefeld is taking over the plotting duties on The Savage Hawkman starting with issue #9. After sleeping on it for a few days, I am still not happy about it. First off, I have to ask the question: Why is DC putting so many eggs in one basket? If the "New 52" was an opportunty to get new voices and faces on their comic properties, why is one guy taking over three books in one month? A full 5.5% of the DC "New 52" comics will be plotted by Rob Liefeld, an artist who is not known for being a crossover guy. I solicited opinions from my friends on Twitter and got everything from "DC execs are grown up X-Force/Youngblood fanboys" to "Rob blackmailed Dan DiDio." Frankly, I'd buy any of those explanations at this point because I cannot figure it out personally. This to me raises the question of desperation. That is, is DC getting desperate with some of these titles? Are Savage Hawkman and company books which are essentially dead in the water and they'll throw anything out there to keep them going for a few more issues? DC made no bones about the fact that the lower selling titles would bite the dust at issue #8; was putting Liefeld on these books an effort to keep that number at 6 titles rather than 9? After issue #12 will we get three new "Wave 3" titles replacing Savage Hawkman, Grifter, and Deathstroke? Wouldn't surprise me in the least. The most dispiriting thing about all of this for me is that it seems that The Savage Hawkman is destined to be yet another failed Hawkman solo series, another aberration in the long and winding history of the character. 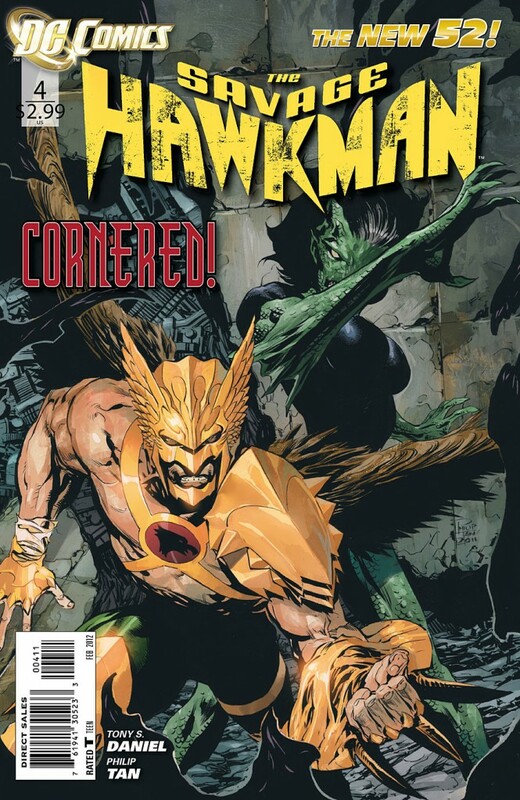 The "New 52" represented a great chance to reinvent and streamline Hawkman and tell new and exciting stories with him. But right now all I can think is that this will all be soon forgotten. Of course, there is always an upside when your monthly comics are cancelled: Less new comics means more time to read old comics. And I have tons of old comics to read. So what are you thoughts on this turn of events? From IGN, we have an interview with newly announced Savage Hawkman scribe Rob Liefeld, where (amongst other topics) describes his take on the Winged Wonder. IGN: In the past, Hawkman has been notable for a rather convoluted history. Is there a difficulty in paring down a character like that to keep the New 52 mantra of accessibility at the forefront? Liefeld: I agree and here both Carter and the reader will share his journey to learn his heritage and that of the Nth metal as he travels the globe in pursuit of the truth. We learn as Carter learns and as he is attacked from all sides, he becomes the aggressor, he wants answers and wants control of his life and he is going to get it no matter who stands in his way. I am still not enthusiastic about this news and this interview does not change that feeling. I have a bad feeling that Hawkman will become even more of a berserker, all fighty-fighty-run-run moreso than anything else. But time will tell I suppose. According to The Source, Rob Liefeld is joining the team of The Savage Hawkman as a plotter starting with issue #9. Liefeld will be plotting THE SAVAGE HAWKMAN, catapulting the story into the intergalactic arena and pitting the Thanagarian warrior against alien foes in extreme gladiatorial combat. HAWKMAN fans can look forward to a cosmic mystery with plenty of action. Can honestly say I am not thrilled with this news. I didn't mind Liefeld's art on Hawk and Dove, but bringing in a new plotter four issues after bringing in a co-writer seems to stink of desperation. And when you consider that co-writer is another artist, and one who is not exactly known for being a solid writer, it seems that this may be a bad sign for The Savage Hawkman. I am digging the book as it is and I am not thrilled with changes like this coming down the pike. We'll have to wait and see how this plays out, Hawkfans. Right now I am not optimistic. Summary: At Dr. Kane's lab, Hawkman and Morphicius duke it out while Aksana battles the Plague beasts. Morphicius claims to be stronger than ever thanks to Hawkman bringing the Plague back to him last issue, but Hawkman battles furiously, cutting off one of the alien's hands and driving him back. But Aksana warns that the Nth metal weaponry are actually helping Morphicius; the alien taunts that the Nth metal properties he absorbed has made it impossible for Hawkman to hurt him. Morphicius also mentions that the Nth metal is Thanagarian, which surprises Hawkman. Back in the battle, Aksana is overwhelmed, but saved from the tide of Plague by Hawkman. In the middle of that, Morphicius has made his exit, tracking Dr. Kane (who took the time to save his alien genetic samples) to the stairs. The alien easily overcomes Dr. Kane, and begins to absorb his life essence. Hawkman makes the save, even though he tells Dr. Kane he should let him die. The Winged Wonder batters Morphicius back, and knocks him through a wall to the cryo-chamber room. There, Hawkman tells Morphicius that he figured out it was the freezing depths of the ocean which kept him contained, and uses a liquid cryogenics agent to freeze Morphicius solid. Waker suddenly appears, claiming to be a friend, and tells Hawkman that while he has stopped Morphicius, he must stop Dr. Kane from escaping with the samples. As Hawkman jets to the roof to put the kibosh on Kane, Waker muses to himself that he holds the key for... Katar Hol. A few days later, Carter meets up with Emma while at ConEd getting his lights turned back on. They talk about how Carter dropped the alien samples off with Professor Ziegler, and Carter tells her that he is going to stick around for a while. The happy moment is short lived, though, as Carter takes off his sunglasses and sees that everyone on the street now looks like a walking corpse! Review: Well, as befitting a comic with the title of The Savage Hawkman, the blowoff to the first story arc is a viscious brawl. (Even the title, as it is parsed on the first page is "The Savage Hawkman vs The Black Plague.") Daniel looks to be enjoying writing a bruiser like Hawkman and letting loose with some of the brutal back and forth between him and Morphicius. It's very satisfying to get some real action here, especially after a fairly tame third issue. Tan's art, for the most part, really shines. The panels of the battle between Hawkman and Morphicius are fantastic, with lots of damage being done to both sides. There's a sequence where Morphicius slashes Hawkman's face, damaging his helmet in the process. Hawkman returns the favor to bashing the alien's hand off using the spiky side of his axe. Yeeouch! There is one incredibly awkward panel of Aksana jumping while attacking Plague with each limb. I'm still not 100% sure what that was supposed to be. Daniel's script is for the most part fairly straightforward. There's an alien monster and Hawkman fights it. Not the deepst plotline, and the script doesn't do much to elevate it. There's a lot of macho talk on both sides, which seems appropriate so I can't complain too much. But there's several little bits dropped here and there which make this a little more meaty. For one thing, when fleeing, Dr. Kane tells his pilot to take him to New Hampshire, saying "You know where." A secret base for the NLAS perhaps? Also, when Dr. Kane is reviving Waker, there is another chamber next to Waker's. Who's in there? And what's the deal with Waker anyway? The big one of course is Waker dropping that he holds the key to Hawkman, and calls him Katar Hol. Combined with Morphicius's statement of the "Thanagarian Nth metal," what does this mean? Is Carter really Katar? Is Waker telling the truth? And if so, what is the connection between them? There's a lot of mysteries afoot which hopefully we will see explored in the coming issues of the title. Overall, I liked this issue. It was a little quick due to all the fighting, but I found it a satisfying read and conclusion to the first story. Speaking of, as a launching point this was something of an odd duck for the new Hawkman title, but I can honestly say that I enjoyed every issue and am very much digging this team. There's been some things I didn't like -- Carter's surliness is pretty off putting, for one, and the dialogue still tends to get heavy-handed at times. But no book is perfect, and all I ask for is to be entertained, which I certainly was. I am hoping that the addition of Jim Bonny as a co-writer will only help take the book even higher. 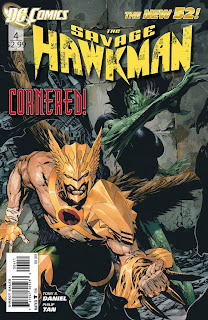 This is a new spin and a new direction for Hawkman, and for right now I am just along for the alien-smashing ride. Well, shows me what complaining gets me. A few weeks ago, astute readers will recall that I whined about not being able to find the Imaginext Hawkman toy anywhere, despite Target taunting me with it under plexiglass. Well, it turns out I should have just gone over to Walmart, where a chance trip down the "Little Guy" toy aisle lead me straight to this two pack! Man, what else can a guy ask for? 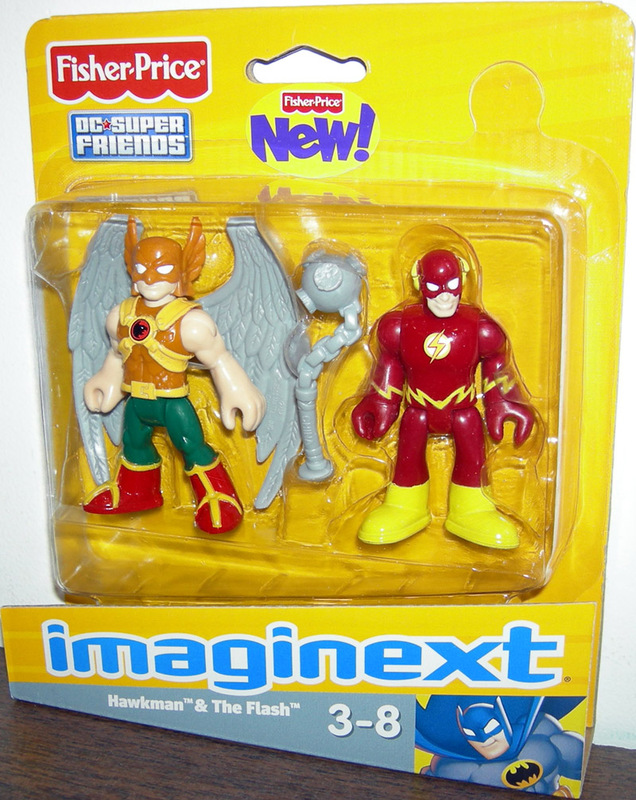 A Superdeformed two pack of my two favorite DC heroes? And Hawkman armed with a mace to boot? Can't wait to open these guys up and play with them! Heck I can get my older boy in on the fun too! Image: Imaginext Hawkman & The Flash, 2011, image retrieved from Go Figure Action Figures. Summary: At Prof. Ziegler's lab, Carter Hall examines Morphicius's containment unit, when it mysteriously opens up and a hologram is displayed. A judge from the High Council explains that Morphicius and his plague have been released, but the hologram shorts out before the judge can explain what the alien's weakness is. At Dr. Hogarth Kane's lab, Morphicius is strapped down to a lab table, where Dr. Kane explains that he is his latest experiment. Morhpicius claims that he will kill Dr. Kane, but Kane's assistant Aksana cuts into the beast's chest with a giant saw. Carter heads to the home of Emma and Prof. Ziegler, and finds out that the only person who had unfettered access to the lab besides the Professor was Terrance. Hawkman tracks down Terrence, who is being attacked by one of Morphicius's plague beasts. Hawkman stops the creature and interrogates Terrance, who offers to take him to Morphicius. At Dr. Kane's lab, the autopsy is complete, and all that is left is the head and brain. Kane is excited because it appears that the cellular organisms in Morphicius's body can both heal and destroy. Hawkman arrives, leaving Terrance on the roof. Before he can get inside, though, Morphicius's head comes back to life! 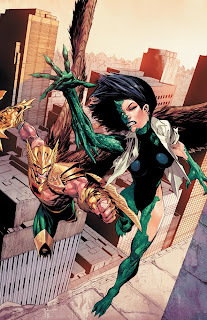 Aksana changes form into a humanoid reptile to intercept him, but Hawkman crashes into the lab, and the two begin to tangle. As they fight, Terrance changes into a Plague beast and shambles to the head of Morphicius, where the alien is reborn! Review: This is a fairly fast moving issue, with a lot of jumps here and there. The scenes with Dr. Kane and Aksana in the lab are the most interesting parts of the first half, as the scene with Carter seeing the hologram of the judge doesn't really answer many questions. It's still a little confusing to me what the deal is with Morphicius and his Plague, which is annoying. Sometimes you get a "middle issue" and that's what this one is -- the pieces have to be moved together for the finale in the next issue. Daniel's dialogue fares somewhat better than his story, without some of the clunkiness in the non-costumed scenes we got previously. I liked Carter's line to Emma of "Actually, I smelled coffee..." quite a bit. I like Tan's art style, and having him drawing alien monsters and dudes in armor fighting is a strong suit! Overall, this issue is the least one so far of this series. I didn't dislike it, but it was not nearly as fun to read as the first two. Still, if you liked what Daniel and Tan did on the first two then you will be on board for this one as well. Image: Justice League Hawkman animated GIF, image retrieved from Tumblr. I got my box from DCBS tonight, and of course I immediately got out my copy of The Savage Hawkman #4 to read! Well, the first story arc is wrapped up in an action packed manner, which is not unexpected but still appreciated. We get some answers about Morphicius, but none about Dr. Kane, Waker, or Aksana. And one piece of information makes us even question who our hero really is. Tan's art generally looks fantastic although some of his battle shots look a little awkward (there's a panel with Aksana doing... something which I have yet to figure out, and at this point am willing to chalk up to her alien physiology). Daniel's writing is straight-forward and straight ahead, very bold and macho, and certainly not subtle. Upon first reading I am giving this issue a reserved thumbs up. I want to read the issue again and then the entire first arc once more. More detailed review to come... right after I do one for #3! DC has not released the next set of solicitations yet, but they have released a few covers on The Source, including this one to The Savage Hawkman #8. Looks like Hawkman will continue to tangle with Dr. Kane's assistant Aksana, if this cover is any indication. So the alien angle looks to be an ongoing thread in this series. Image: The Savage Hawkman #8, 2011, Philip Tan. Yeah, I know, I sort of vanished there for a while. As a comics blogger, that is sort of how we do things. Every now and again, we disappear for a spell and then come back onto our blogs and make posts like this. I'd like to say that my jet-setting lifestyle was ramped up during the holidays and that I couldn't possibly take time away from the intense and utterly naughty activities in which I was participating to post here, but the truth (as usual) is much more mundane: busy with the holidays, busy with a sick infant, busy with work, busy with travel. So anyway, that having been said, I should be getting my new box of comics today (according to UPS, anyway), contained within will be The Savage Hawkman #4. Now I know what you are saying (hopefully you are not reading this at work...) "Luke, you lazy bum, you haven't done a full review of #3 yet!" Yeah. I know. I'll get on that this week. Just a matter of putting my foot down and writing the dang thing. So that should be hitting shortly. Here's to Being Carter Hall in 2012! Let's soar higher than ever!